If there’s anything I’ve gained from corporate America it’s realism and bitterness in abundance. Chris just wrote an excellent post on the expectations for starting salaries in electrical engineering. 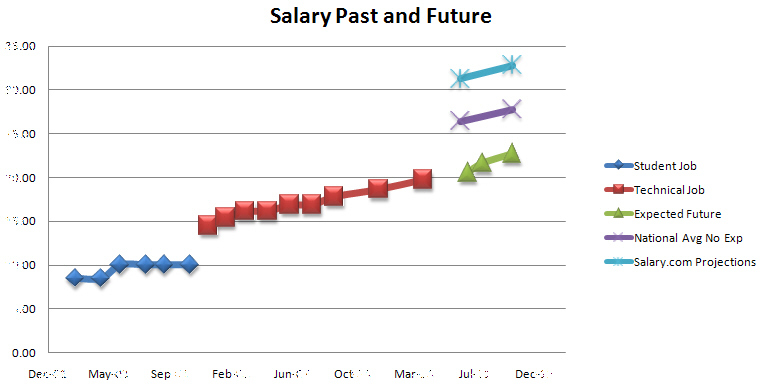 His curve for how an engineer’s salary might start out comparitively high but then flatten out over time is spot on. Chris gives some good numbers that are fairly reasonable for a mechanical engineer as well. Back before this recession the average graduate with a BS from my institution (which ranks fairly well, but not in the top 10 or anything crazy) was about 55k. Most of these graduates would be taking jobs in high cost metropolitan areas so this might run a bit high compared to other places. And there are several great comments on the post. An old engineer discusses the importance of training in the latest technology and how companies often try to squeeze employees out if they haven’t moved up or found a niche. John Dowdell talks about how an employee doing engineering work can achieve pay parity with those who have a degree or actually be recognized for the training and development one does on their own. John’s issue is similar enough to my own to be uncanny. Like an old engineer recommended I mostly had to train myself on CAD. My university was not effective in this and my employer had no desire to invest in significant employee training. Thanks to several excellent local work training programs and community colleges I got started and then used the CAD programs at work on my own time offering to do work for other groups and at a level above my title and paygrade just to get the experience. This I think will be the future in regards to employee training with a combination of really reaching out at work as well as being willing to educate yourself on your own dime and your own time in the evenings and weekends. So then you’ve gone through all this, how do you get recognition? If you’ve trained yourself, and are already doing the work, what incentive does your employer have to recognize that? In the past you might have been able to take these skills and garner an offer from another company. But in this economy that is near impossible, and if you have the skills but not the credentials other companies have enough candidates to choose from they can usually get both from somewhere else. When I moved into technical work I found my salary had improved from my early days as cheap student labor. I trained on my own both for hands on skills and academic credentials. These along with consistent and steady hard working resulted in gradual movement in my salary but nothing exciting. In Chris’s post he recommends a lot of great salary tools. But as I said before, in this economy they can be misleading. As someone with skills and experience I have an advantage over other more traditional students. But I am an oldtimer in corporate America and I know what the future will look like. I know the max increases I can expect at my job and I know the economy has meant despite my looking good on paper I’m not getting any bites on jobs. Because I like graphs so much (smudged a little to protect my superhero identity). In blue is my cheap labor days and red my current technical path. Green is what I can expect as a reward for the training and credentials I have received. Purple gives you numbers I likely would have started at (admittedly not in a recession) if I had started in my career with a degree and no experience. The light blue at the top is what salary.com tells me what I should make. However, taking either of those two hypothetical numbers to my boss would result in nothing. It’s not so much that he’d laugh at me, but just put his hands up and tell me he’s doing what he can and that’s it. I’m so accustomed to the excuses of “company policy” or “HR says” or “but that employee’s situation is different than yours because” that I could write their excuses myself and save them the trouble. So while I think looking at starting or average salaries on salary.com or the government’s Occupational Outlook Handbook are useful I think it’s also wise to temper our expectations. Chris is right that living a low inflation lifestyle is good but it’s also important that the traditional wisdom might be leftover from a 90’s job economy. That the training and overtraining and learning and going back to school and developing your hobby are all essential. But now they’re essential just to hang on to your job or stay relevant. Much as we engineers wish it could be engineering is not always a merit based path in the business (or even academic) world. As Cherish just talked about, academic salary expectations are much lower than industry and made worse both by the economy and due to an oversupply of the highly educated in academia. One of the students from my senior project just got a job offer for 65k from Boeing and she has 1-2 years of part time internship experience compared to my n+3 years of full time industry experience. So luck of the draw, location and timing can play crucial roles.